A prominent new voice joined the international chorus of protest against U.S. preparations for war against Iraq on Thursday. Former South African President Nelson Mandela delivered a fiery speech denouncing the United States and aiming harsh personal criticism at President Bush. Mandela, a Nobel Peace Prize winner and one of the world's most respected elder statesmen, let the Bush administration have it right between the eyes, reports CBS News Correspondent Tom Fenton. "It is a tragedy, what is happening, what Bush is doing. But Bush is now undermining the United Nations," Mandela told the International Women's Forum. Mandela said he would support action against Iraq only if it is ordered by the U.N. He urged the people of the United States to join massive protests against Mr. Bush and called on world leaders, especially those with vetoes in the U.N. Security Council, to oppose him. "What I am condemning is that one power, with a president who has no foresight, who cannot think properly, is now wanting to plunge the world into a holocaust." And that wasn't all. He attacked America for its record on human rights and for dropping atomic bombs on Japan World War II. "If there is a country that has committed unspeakable atrocities in the world, it is the United States of America. They don't care." That brought an unusually subdued reaction from the White House. 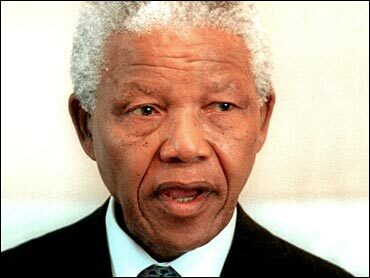 "Nelson Mandela was a great leader. He remains a great man," said White House spokesman Ari Fleischer. "But on this the president and Nelson Mandela do not see eye to eye." Fleischer pointed to a letter by eight European leaders reiterating their support of Mr. Bush. "The president expresses his gratitude to the many leaders of Europe who obviously feel differently" than Mandela, Fleischer said. "He understands there are going to be people who are more comfortable doing nothing about a growing menace that could turn into a holocaust." While Mandela has repeatedly condemned U.S. behavior toward Iraq in recent months, his comments Thursday were far more critical and his attack on Mr. Bush far more personal than in the past. "Why is the United States behaving so arrogantly?" he asked. "All that (Mr. Bush) wants is Iraqi oil," he said. He accused Mr. Bush and British Prime Minister Tony Blair of undermining the United Nations and U.N. Secretary-General Kofi Annan, who is from Ghana. "Is it because the secretary-general of the United Nations is now a black man? They never did that when secretary-generals were white," he said. He said Mr. Bush was "trying to bring about carnage" and appealed to the American people to vote him out of office and demonstrate against his policies. He also condemned Blair for his strong support of the United States. "He is the foreign minister of the United States. He is no longer prime minister of Britain," he said. That echoes a theme adopted by war opponents in Britain. Blair is to meet Mr. Bush for talks on Friday. Mr. Bush hosted Mandela at the White House in November 2001, where Mandela expressed his sympathy for the Sept. 11 attacks and said he supported operations in Afghanistan. Last July, the president awarded Mandela the Presidential Medal of Freedom — the nation's highest civilian honor — dubbing him "perhaps the most revered statesman of our time."